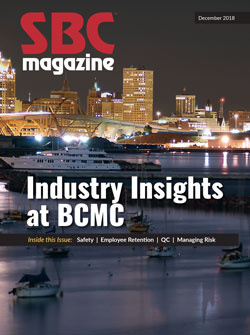 There was quite a buzz on the BCMC show floor this year concerning production automation. New machinery represents a significant capital investment, and the real question on everyone’s mind was how long it would take to recoup that expenditure. The real internal debate is where can you get the best return? At the bleeding edge of the spectrum there are the latest advancements in robotics for the component manufacturing industry. This technology has come a long way in the past decade, and the abrupt shift away from a human production workforce is appealing given the struggles we all have finding enough people to fill the openings on our manufacturing lines. While glimpsing that potential future of our industry is exciting and thought-provoking, the latest advancements in the more traditional automation (saws, material handling, lasers, jigs, etc.) come with their own set of questions. What processes would benefit most from automation in your current facility? Can they truly deliver on the increased production they appear to promise, or does it just shift a bottleneck to another part of your operations? One of the biggest issues is whether any new piece of equipment can help CMs meet the customer demand they perceive coming at them over the life of the machine. What do they do if they have to buy more than one to meet future demand? Is it still worth it? Beyond all of this are the logistical challenges new machinery brings to the table. How long will a production line need to be down to install new equipment? How well will it integrate with everything else I already have in place? In other words, what’s the extent to which I can just “plug and play” the equipment? How much time in training will it take? What I don’t like about all of these questions, which are just the tip of the iceberg really, is that they all come from a defensive position. I think there is a lot of opportunity lost because, for the most part, component manufacturers (CMs) are in the mindset of waiting to see what our equipment vendors come up with next. I would argue CMs need to be out in front, asking instead what they want and need from their vendors. For that reason, I am excited about SBCA’s Equipment Council. Its formation was initially discussed a few years ago at an SBCA Open Quarterly Meeting (OQM) in Montana, and most recently at the OQM in California. This council can be an excellent conduit for communication between CMs and vendors. It will allow CMs the ability to feed back what they want to see and what their struggles are. Those conversations, both at the table and later after dinner, will provide a broader perspective for both CMs and equipment developers. Ultimately, the council will facilitate a sounding board that can provide proactive feedback before research and development dollars are spent, as opposed to the current model of reactive marketplace responses. This focused communication will allow CMs to give their viewpoints earlier in the development process and hopefully lead to new equipment that CMs find even more valuable. If you’d like to know more about how to get involved in SBCA’s Equipment Council, contact me at president@sbcindustry.com.